Most regular dog fence systems are too big and too powerful for dogs under 15 lbs., but that is this unique dog fence's specialty. The PetSafe Elite Little Dog PRO-Grade Fence System features lowered correction levels and the smallest, lightest receiver collar in the industry. At just 2 ounces the collar is perfectly comfortable for dogs right down to the toy breed sizes. The PetSafe Elite Little Dog PRO-Grade system is ideal for multi-dog households where the dogs are of differing sizes because the system is compatible with other PetSafe fence collars for bigger dogs. Our PRO-Grade system upgrades your wire, surge protection, and warranty to make sure you get the most from your system. 1000 ft. Heavy Duty Pro-Grade Wire: Our Pro-Grade Kits include upgraded 14-gauge PRO-Grade wire. This heavy duty, polyelethene plastic coated wire is what would come with a professionally installed system like Invisible Fence®. Upgrading to thicker, more durable wire helps prevent costly and time-consuming wire breaks. 10 Heavy Duty Ground Staples: Ground staples are perfect for laying out your dog fence wire or for installations that run through terrain where burying the wire is difficult or impossible. Our heavy duty ground staples are guaranteed to keep your dog fence wire in place. 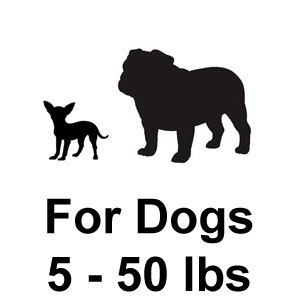 For Dogs 5 - 50 lbs. Flexpetz sold us the Elite Little Dog Pro fence and enough wire for 4 acres. We got the yard staples and did the "above ground install", so that we wouldn't have to rent a trenching machine to bury it. At first, the test tool didn't work in the corners, so we called Flexpetz to see what the problem was. Jonny told us about making the corners more curved, because the sharp turns can cancel out the shock. We adjusted and that did the trick. The fence works like a charm now and we're very happy. Our little Cujo has lots of room to roam and play and knows where his boundary is, so we never worry about him tooling away. The fence seems okay, but the collar was too small for our dog. We got this fence for our 40 lb bull terrier, because the fence says it works on dogs up to 50 lbs. However, even on the highest setting, he runs right through it. We didn't want to dig up the wire to send it back, so we ended up having to get another collar, with stronger shocks, just for the thing to work. This works for both my dog and cat. Was looking for a fence that could help contain my animals in the backyard. I like to let my pets play outside but hate the thought of them getting hit by a car. I am glad I found this package and was able to add a collar for another pet. Made my husband install the system, which took about 4 hours. I think this system will save me alot of time and money compared to a real fence, and also last the lifetime of my pets. Thanks for selling such a fabulous product. Grade A for the Elite Little Dog Pro Grade fence, Works without any problems. The PetSafe Elite Little Dog fence is a shock fence system designed for the smaller stature dogs, and works perfectly. Initially, we were getting an alarm on the transmitter, but found out that we didn't have the wire secured in it well enough. Once we re-seated that wire, the system came up as it's supposed to. The collar works fine, as we walked to perimeter with it to make sure there wouldn't be any weak spots. The correction was consistent, so we're all ready to start training Buster. It's not too complicated of a setup, so I can easily recommend this system to my older friends and not have to worry that it will be too overwhelming. I will recommend this dog fence system to my friends. Overall I am extremely excited about this dog fence system. I have two very small dogs that are my life. I was advised by FlexPetz the PetSafe Elite Little Dog Fence PRO-Grade would be a great fit for my dogs. After doing more research on the FlexPetz site I decided to purchase the system that was suggested I utilize. I only have positive things to say about this dog fence system. The pricing is affordable and my expectations were surpassed. I was concerned that the collars would be to large for my very small dogs. The collars were a perfect fit for toy breed dogs. My brother is a dog lover and I recommended that he purchase a dog fence system from FlexPetz. The PetSafe Elite Little Dog Fence PRO-Grade is a perfect 10. I have a small dog and bought my dog fence system from FlexPetz. I am very happy with the PetSafe elite little dog fence pro-grade system. It has surpassed all of my expectations. I conducted extensive research to ensure that the dog fence would meet my needs. My dog weighs about 10 lbs. The collar fits my small dog well and only weighs 2 ounces. There are not many dog fence systems on the market that are specifically for toy breeds. If I decide to buy a bigger dog in the future this dog fence is compatible with larger Petsafe collars. The 3 year warranty is another reason why I purchased this dog fence system. Overall, I only have positive things to say about this system. I love the fact that this system is specifically made for small dogs. It is a great dog fence system. This dog fence is terrific. I have been searching the web for a long period of time looking for a dog fence that can work with my small Terrier. I decided to contact FelxPetz. I spoke with a knowledgeable customer support representative about which fence would work best with my small dog. I was pleased with the quality of this dog fence. 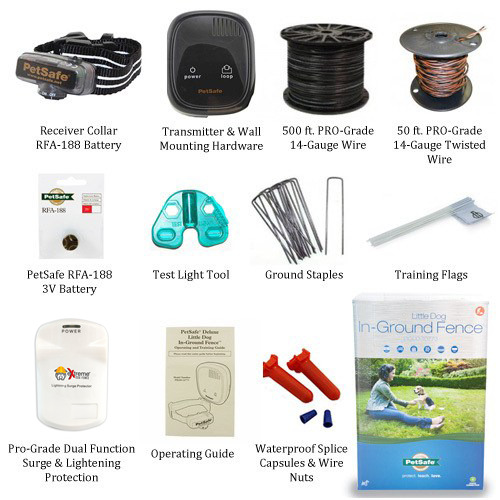 I have tried a dog fence in the past from another manufacturer The PetSafe elite little dog fence pro-grade is a much better dog fence and has given me better results. My dog is very little and this system is a great choice because it is designed for small dogs. The collar fits my small dog very well. Overall, this dog fence is terrific and I am very happy with it. This is the best dog fence. After hours of searching I came across the FlexPetz website. I have two very small dogs and wanted a dog fence to allow them a bigger area to play. I contacted FlexPetz and inquired about a dog fence for my to small dogs. I was recommended an Elite Little Dog Fence for my dogs. I am satisfied with every aspect of my purchase. It has made life very easy. My small dogs are getting ample amounts of exercise. Thanks FlexPetz. I was referred by a good friend of mine to go to this website and speak with the people here. I am very glad I did. My friend installed her fence about a month prior to mine and she loved how easy and well made it was. Hers was for the bigger collar and system due to her dog, but I have a toy dog that could not stop leaving the yard to go see my neighbor at random times. I also bought an indoor unit to go with the system because there was one couch I did not like him going on but could not find a way to keep him off of it. I like the ease of it all and although he is not the brightest lil dog, he still stays away from where I do not want him. I was impressed with the quality and the service I received and although my friend already told all of our friends, I will be more then happy to vouch on this end for how well you take care of your customers. The shipping was nice a quick and the wire made me confidant for the above ground install. Thank you for answering all of my questions! This is a dog fence that I truly like. This fence has made my life so much better and easier. Walking the dogs can be a little much at times. This dog fence has made it easy to have the peace of mind that my dogs get more than enough exercise. I also no longer worry about the dogs chasing cars. Sounds kind of strange, my dogs love to chase cars. This dog fence has removed that issue. Thank you so much FlexPetz. Awesome system for my little dogs. A best buy. The PetSafe Elite Little Dog Fence is a must have for dog owners. This system is effective and super easy to use. Once I trained my dogs on this system my life has become much easier. My dogs are able to get exercise without me having to walk the dogs 5 times per day. I can leave home and have the assurance that they are contained and are safe. This is a must have for dog owners with small dogs. Fence System for really small dogs! I just bought this fence system for my Jack Russell Terrier and it works great! I wasn't sure what unit to buy since my dog is really small but when I called your company the customer service was great so I didn't hesitate to get this product. I have dealt with many fence systems, and there aren't many companies that offer a fence that will work with little dogs like a chihuahua or pom. The Elite Little Dog Pro Grade fence does just that. I really can't have big dogs, so I was more interested in something that's not bulky or heavy, but will still put out a shock strong enough to keep the little dogs in the yard and not turn them into burnt toast. I would surely be glad to suggest this fence package to any small dog owners. It's humane, small, and it works. Great fence and great company. While I was at first taken back by the price of the prograde systems I priced around and saw that flexpetz really had the best value for what they offered. The collar still seems a bit large on our min pin but he does have the skinniest neck and the fit seems good. He is such high energy though and a master escape artist that we needed something to keep him in the yard. The assistance choosing a system was much appreciated. My English Bull dog and stupid Jack Russel needed this system before they got themselves killed. I liked how I could customize the fence just to what was exactly needed. We have a very long dirt driveway and both of my dogs would chase the cars as they were leaving trying to bite at the tires. I was able to now get them away from the driveway and now I feel more comfortable leaving them without having the feeling i am about to run over one of my dogs, along with other people who may not notice what they are doing. My dogs have free range in and out of the house so there was no stopping this from happening before when there were deliveries and people coming to visit. Thank you for the fact that you also provide customer support along with the upgraded system. The fact that i was placing the wire near the driveway had me worried but the thicker more durable wire puts me at ease about that. Perfect system for people to customize with and there are so many layouts possible that I would recommend this to anyone looking. The pro-grade I believe is well worth the money. When I was shopping for a system I noticed some in my local pet store but the packaging was so much smaller and when I did more research at home I found this and I was already sold. I am happy with my purchase and if you choose this option I think you will too. This system is great and I am glad that I made decision to purchase it. The system is very high quality and lives up to durability that is portrayed by the company. I also have piece of mind that it comes with a 3 year warranty. This is important to me. Installation was quick and simple. We had the system up and running within a relatively short time. To my pleasant surprise my husband and I completed the installation all in one Saturday afternoon. Overall, I am extremely happy with the entire system. I like the small collar profile. Good for a chihuahua. Overall happy. My only concern was that I guess I expected the transmitter to be a heavier piece. It's pretty light weight. Definitely not cheap, because it works excellent. I don't have a dumb doggie. I thought the training would take longer too. However, I'm all good to go and everything is great. Really happy with the customer service department at Flexpetz. If not for them, I'd be lost. Thank you guys. Perfect for our little one!! We had doubts about these systems but putting up a physical fence was not something we could do in our area due to the granite right under the surface. After looking into and checking out multiple sites we decided to give this a try. We were cautious about the shock and how it would affect our 8 lb min pin but this system fits perfectly and the shock levels can be adjusted to nothing more than a slight nick. Just enough to get her attention. She is quite smart and was trained in less than 3 days. Under the advice of those at flexpetz we continued with the 2 weeks of training and now have the peace of mind she will not be testing the boundaries anytime soon. Thanks for the help as we are now thinking of adding another member to the family since we found a safe way to keep them in the yard and away from the road.